10 year old German Shepherd Dog 'Z' is in world class condition and eats an extremely healthy diet. Think Earthborn Holistic Grain Free Meadow Dry Dog Food and treats that are comprised of organic pumpkin, green beans, peas, cabbage and baby lima beans. Z's only supplement was Udo's Choice Pet Essentials. She even is on a 'fast emulating' diet, i.e. alternating days of full food intake with 65% calorie intake. Z exercises approximately 6 days per week. She'll sprint fetch 150 yard to 300 yard dashes until exhaustion in the A.M. most days. Other days, typically during inclement cool/cold weather, she walks with a weighted best (20% of body weight). Rest days include moderate walking. At our wits end a medical doctor recommended CBD oil. CBD is a type of compound found in cannabis sativa called a cannabinoid. In fact, there are over 100 types of cannabinoids in the cannabis plant, with the most well-known being THC - the bit that gets you stoned. However, and this is important; CBD is not psychoactive in the respect that it doesn’t cause a high feeling. When CBD was identified in the 1940s, scientists assumed it had little or no effect on the body. The main focus back then was researching THC and its pharmacology. Fast forward to the 1990s and a research team led by Professor Raphael Mechoulam, commonly acknowledged as the grandfather of cannabis research, discovered what has come to be known as the endocannabinoid system (ECS), and this changed everything. The ECS is a vast communication network of cannabis-like chemicals, called endocannabinoids, and receptor sites found across all cells in our bodies. It is known as a homeostatic regulator, meaning that its main action is to bring balance to our bodies and minds. Think of it as being like a dimmer switch, turning up or turning down activity to ensure equilibrium is reached, which after all is the perfect environment for optimum health. THC was seen to activate this system, because it is an almost perfect fit for the receptors in our brain and central nervous system, as well as partially activating those in our immune system and gut. Blocks the orphan receptor GPR55’s signaling, which may act to decrease bone reabsorption. Now, DO NOT rely on our results. Ask a veterinarian. We went with the plan that we'd max out at 16MGS of cannabidiol we'd try in Z, starting with 1MG one hour before bedtime and SLOWLY working up. (Roughly we would head to a max of 4MG per 15 pounds of body weight - 16MG in a 60 pound dog.) One week in and at 3MG she was sleeping through the night. It was a miracle. A true, we don't use the word lightly, miracle. Since she was still sleepy early A.M. we backed down to 2MG and that is our sweet spot to this day. Now on to the thunder or Fort Dix artillery. We want to use the lowest dose possible so we've had to experiment. IF we know fireworks, Ft. Dix, or thunder is expected over night -- we give her 4MG at bedtime. That usually works. If it doesn't and she awakens and is pacing or nervous - we give another 2MG. That has had 99% efficacy. IF the thunder or Ft. Dix noise is during the day we'll give her 2MG an hour or so before it is supposed to start. Another 2MG as it occurs if necessary. THAT is, again, our sweet spot with approximately a 99% cure rate. It is worth a try. And that's without explaining some of the possible OTHER benefits of CBD like anti-cancer, pain, inflammation, etc. We use Endoca brand CBD oil. (Many of the what is CBD Oil and what can cannabidiol do above is from their site.) Raw Hemp Oil Drops 300mg CBD + CBDa (3%) contain 300 1MG drops and runs a very respectable $31 dollars. 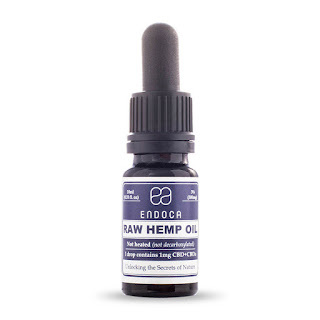 Here is the exact CBD oil from Endoca that we're currently using. And we're not even affiliates. We just want all dog owners to know what they might also call a miracle. *Update -- a little more data. If a BIG thunderstorm is impending and it is not within an hour of bedtime...5MG is our go to. Especially if we can get it in her an hour or so prior to a storm. (They know better than us and can always tell within 30 that one is coming). 5MG (with us home with her) and her panting is 15% of normal. Her scratching of floor mats is 10% of normal. And if we head to sleepytime in our darkened bedroom (as the storm has lasted 2+ hours or we have multiple ones) with fan and a couple of white noise makers -- she'll lay down and not pace.